"The combat planes belonging to the coalition led by the United States, attacked the army position in Jabal Ghurab, some 150 kilometers [93 miles] east of Palmyra near the border with Iraq," the commander said. "One serviceman was killed and several others wounded," he added. According to a Syrian field commander, the sudden US-led coalition air assault occured after Syrian forces responded to an open fire from three coalition's vehicles, moving towards positions of governmental forces. A sudden airstrike has claimed the life of a Syrian Officer, leaving several other Syrian soldiers injured. According to a Syrian field commander, coalition vehicles were spotted moving away from At Tanf district, where the US-led coalition base is situated. Such an open skirmish between Syrian governmental forces and US-led coalition troops reportedly occured for the first time since the outbreak of the war in Syria. 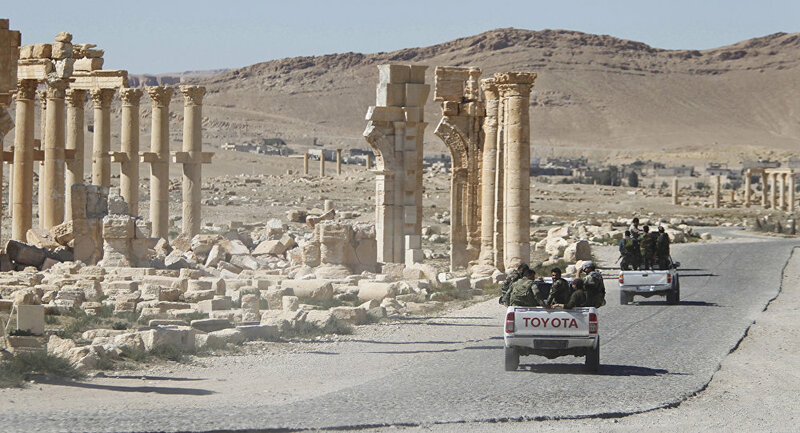 Last week, the Russian reconciliation center reported that the Syrian government troops backed by the Russian Aerospace Forces prevented militants' audacious breakthrough out of the ​​At Tanf area towards Palmyra.